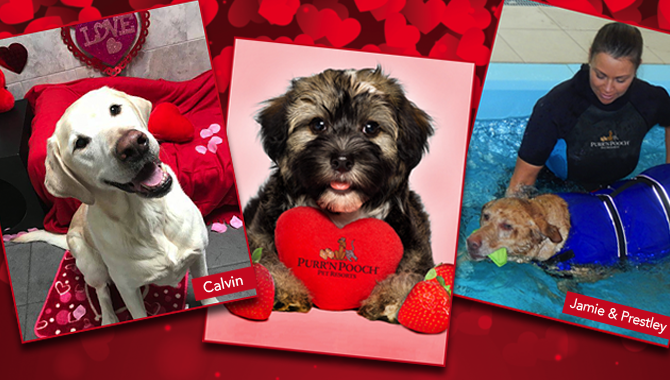 May is National Pet Month and at Purr’n Pooch we have tons of fun in store for your best friend. Our outdoor pools are open and we have a host of spa and resort parties and promotions celebrating the arrival of warmer weather. It’s also wedding season and our pet care team is attending ceremonies and receptions across the region. 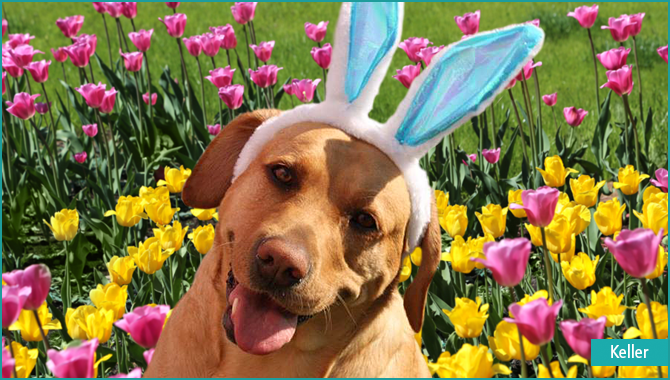 It’s a month blooming with fun of all kinds for people and pets. Friday, May 5 ~ 7 a.m. – 7 p.m.
Parties in Tinton Falls and Wall. Join us for games and treats on the Purr’n Pooch playground as we celebrate our daycare friends born in the month of May. 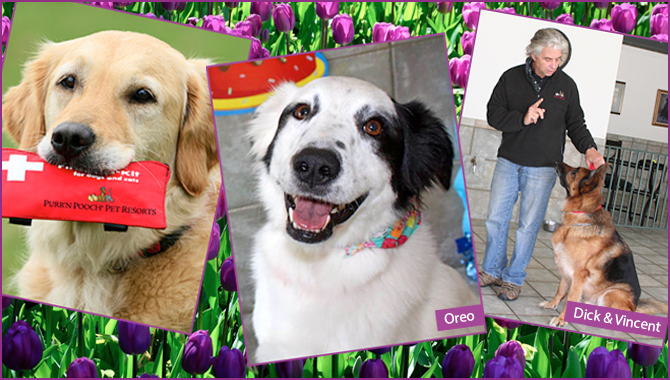 Starting May 11 all visiting pets will get a gift to bring home to their moms in honor of Mother’s Day. Office Hours ~ 7 a.m. – 3 p.m.
24-hour supervised care for visiting pets. Indulge your pet in a relaxing lavender shampoo, paw and leg massage, teeth brushing, and lavender cologne. Shampoo, deep cleans and soothes the skin without stripping natural oils. Price is $25 plus price of bath or grooming. Call 732.842.4949 (Tinton Falls) or 732.528.8100 (Wall) to make an appointment. Include your best friend on your wedding day for a walk down the aisle, pictures and more. We will handle, transport, groom and board your pup for the special occasion. Did you know not all dogs can swim? It’s true. While paddling through the water comes naturally for some canines, not every breed is inclined to jump in and swim. Jaime Plantamura, a swim instructor at Purr’n Pooch Pet Resorts, knows that it can take certain pups some time to feel comfortable in the water. That’s why she takes special time to make sure each and every dog that comes to Purr’n Pooch for swimming lessons gets individual attention and specialized lessons. 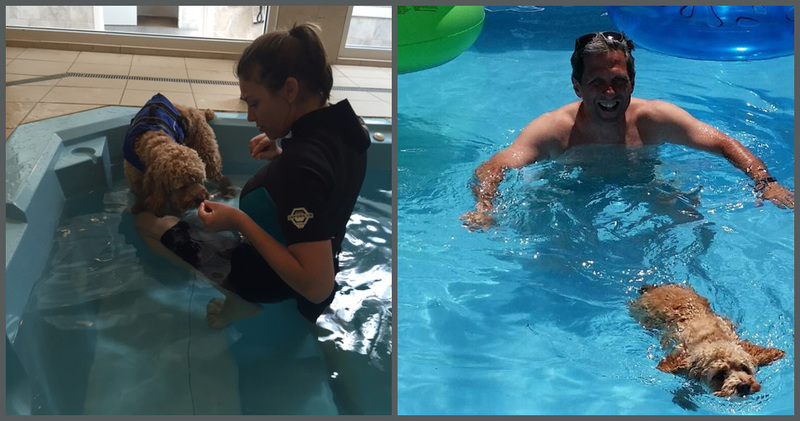 So when James and Margaret Blumenstock of Brielle were concerned that their Cockapoo Daisy would drown in their inground pool, they came to Purr’n Pooch. The Blumenstock’s had an acquaintance whose dog drowned in an inground pool, and they wanted to take precautions so that wouldn’t happen to Daisy. So at just 9 months old, Daisy began swimming lessons with Jaime. Fortunately, Daisy progressed steadily for never being in the water, and is now comfortable with swimming if the need ever arises. To get pups started out in the water, Jaime and the other swim instructors at Purr’n Pooch pay careful attention to each dog’s reaction to the water. If they seem timid, Jaime tries to play with them near the water and on the steps to get them comfortable. The pups need to get accustomed to the noises and feel of the water before being fully submerged. Jaime tries to make each lesson fun for the dogs, giving them treats to help with their adjustment. Dogs wear life jackets to help ease them into the water, where natural inclination allows them to start paddling without panicking. And that encouragement worked with the now 1-year-old Daisy. 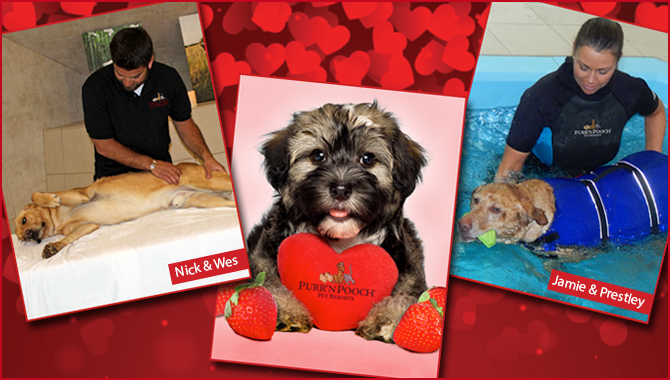 Purr’n Pooch offers aquatic exercise sessions in an indoor spa pool located in Wall, NJ. 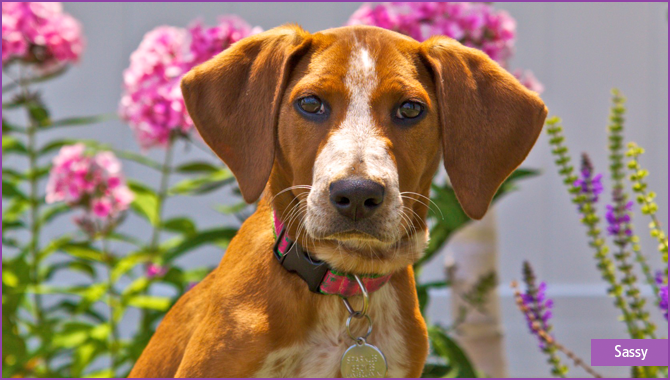 Experienced pet care technicians care and comfort pups with ease and patience. Swimming, games, and other exercise routines are part of the fun as dogs learn to move and play gently in the warm spa waters. Introduce your dog to the water correctly to build confidence, increase fitness and promote good health all while having fun. Private sessions are available and the pool setting is calm and quiet – ideal for relaxation and rejuvenation. For more information on aquatic services offered at Purr’n Pooch, click here. As humans, when we injure ourselves we are able to go to therapy to help strengthen our muscles and get back to our healthiest self. But what happens when a dog needs to heal after an injury or surgery? At Purr’n Pooch, the answer to getting dogs back to their frolicking selves is often aquatic exercise sessions in our indoor pool located in Wall, NJ. Experienced and patient pet care technicians work with dogs, teaching them to move and play gently in the warm water. Aquatic exercise is great for dogs who need hydro sessions after an injury. The spa waters strengthen and gently condition muscles, preventing further injury and lessening pain. Kylie Ann, a Golden Retriever, was just six years old when she ruptured her Cranial Cruciate Ligament (CCL) and meniscus in her right knee and needed surgery. Her recovery was slow and restrictive, leading to weight and muscle mass loss and weakness. Kylie Ann was unable to play with her younger doggie brother, Casey, and became depressed. This worried her owner, Kristin, but what also concerned her was the likelihood of the same injury happening to her other knee. Kylie Ann started work with Nick, aquatic director at Purr’n Pooch’s Wall location, in June 2014. Kylie had never been a big fan of the water and was fearful of new situations and new people, but she already knew and trusted Nick. Turns out, it was a perfect fit. 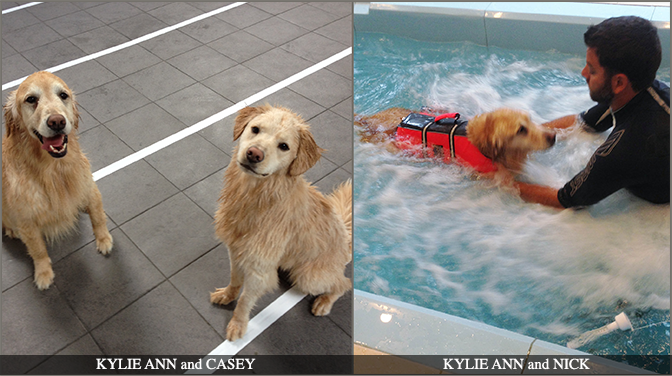 Kylie had early and continued success with her aquatic exercise sessions at Purr’n Pooch, which Kristin attributes to the type of personalized services offered. Kristin also attributes Kylie’s success to Nick, the pup’s beloved technician. “Simply put, Nick is the reason Kylie Ann is healthier, happier, stronger and more confident dog today,” said Kristin. “He’s the best! Kylie Ann was expected to have a slight limp after her surgery, but after three months of working with Nick in the pool, she not only recovered from surgery faster than expected, but she also had no evidence of a limp. In fact, Kylie Ann’s progress was so impressive, Kristin decided to bring her brother Casey, a one and a half mixed pup, to Purr’n Pooch’s Hydro Fun sessions. Casey, a pup rescued from a high-kill shelter, is sensitive and wary of other dogs. But with Nick’s help, Casey is benefiting from this engaging and enriching activity just like sis. Casey started the sessions unable to swim. Now, the pup is learning to surf. Nick uses a surfboard with Casey, encouraging balance and coordination. Kylie Ann continues to work with Nick in the pool and build her strength and maintain a healthy weight. The objective now is to prevent another injury from happening and keeping Kylie Ann motivated and happy. Click here for a video of Nick and Kylie Ann in the pool! Purr’n Pooch offers aquatic exercise sessions in our indoor spa pool located in Wall, NJ. Our experienced pet care instructors will care and comfort your dog with ease and patience. Swimming, games, and other exercise routines are part of the fun as your friend learns to move and play gently in our warm, spa waters. Private sessions are available and the pool setting is calm and quiet – ideal for relaxation and rejuvenation. Click here for more information.